Nonthrombotic pulmonary embolism (NTPE) is embolization to the pulmonary circulation of different cell subtypes (adipocytes, hematopoietic, amniotic, trophoblastic or tumor), bacteria, fungi, foreign material, or gas. It is less common than pulmonary thromboembolism (Figure 1). The clinical effects and pathogenesis of NTPEs are more complex than the “simple” mechanical obstruction. Depending on the specific type, some emboli may cause severe inflammatory reactions in both the systemic and pulmonary circulation as well as in the lung itself. NTPE presents a diagnostic challenge. Symptoms cover the entire spectrum from lack of symptoms to sudden death. The clinical signs range from dramatic acute presentations, such as ARDS after fat and amniotic embolism, to signs observed late in the course of the disease, such as after-tumor emboli. Paradoxical non-thrombotic emboli may also cause CNS signs/symptoms. Acute and chronic nonthrombotic pulmonary embolism is an underestimated cause of acute and chronic pulmonary hypertension. In addition to obstruction of the pulmonary vasculature there may also be an inflammatory cascade that leads to deterioration of cardiopulmonary function. Fat embolism (FE): characterized by the release of fat into the systemic circulation, often after fracture of a long bone. Fat embolism syndrome (FES) is a rare clinical consequence of FE characterized by respiratory distress, mental status changes, and a petechial rash. The embolism of amniotic fluid, which is a mixture of maternal extracellular fluid and fetal urine, squamous cells, lanugo hairs, vernix caseosa, mucin, and sometimes meconium, leads to an idiosyncratic response. The severity of symptoms of this so-called “anaphylactoid syndrome of pregnancy” is related to the host reaction to the antigenic components of the AF. AFE is the only NTPE that is associated with left-sided heart failure. Different from true metastasis as no tendency for tumor emboli to invade arterial wall. Gestational trophoblastic disease (GTD): tumor arises from fetal, not maternal, tissue. Septic emboli: reach the lung from many sources, including thrombophlebitis and infected heart valves, catheters, and pacemaker wires. Cystic hydatid disease (aka, echinococcosis): a parasitic infection caused by larval or cyst stage of the tapeworm Echinococcus granulosus affecting the liver (75%) and lungs (15%). Vesicles or cysts that mechanically obstruct bloodflow cause embolism. Particulate/foreign material embolism: embolic particles may reach lung after injection of foreign materials. Iatrogenic emboli: cement, gas, iodinated oil, glue, metallic mercury, radiotracer, silicone, hyaluronic acid, radioactive seeds, and ventriculoperitoneal shunts. Foreign bodies: bullets, talc, cotton. Gas embolism (venous of arterial): mainly air embolism, although other gases, such as carbon dioxide, nitrous oxide, helium, and nitrogen, can also provoke these symptoms. Are you sure your patient has NTPE? What should you expect to find? NTPE presents a diagnostic challenge, as the condition often presents with uncharacteristic clinical signs that are frequently overlooked. These range from dramatic presentations such as ARDS after fat and amniotic embolism, to signs observed late in the course of the disease, such as after-tumor emboli. Paradoxical embolization may also cause cerebral signs and symptoms. 60% of FES cases present with major symptoms within 24 hours after a symptom-free period of 6-12 hours. 75% of patients develop pulmonary signs, including hypoxia, tachypnea, hemoptysis, and chest pain. FE is one of the indirect causes of ARDS. Neurologic signs range from encephalopathy to coma, do not improve after correction of hypoxemia, may occur without pulmonary signs, and are generally reversible. Fundoscopic evaluation may reveal macular edema and retinal hemorrhages, and fat droplets may occasionally be detected in retinal vessels. Absence of other medical explanations for the acute and dramatic clinical course. No specific lab test either confirms or refutes the diagnosis of AFE, which remains a clinical diagnosis. AFE should be considered if sudden cardiorespiratory collapse occurs in the laboring or recently post-partum woman. However, it should be noted that AFE is often overdiagnosed in critically ill peripartum women, particularly when an element of coagulopathy is involved. Typically occurs in those with suspected or documented malignancy. Symptoms include progressive dyspnea (most common) over weeks to months, pleurisy, cough, hemoptysis, weight loss, and signs of cor pulmonale (15-20%). Only 8% of patients with pathologic evidence for pulmonary tumor embolism have documented morbidity or mortality attributable to the emboli. Metastases to other organs are usually documented prior to onset of respiratory symptoms. However, pulmonary tumor embolism symptoms as the initial manifestation of underlying malignancy have been reported in a few cases. It is important to note that tumor emboli are distinct from pulmonary metastases, and unlike metastases tumor emboli do not invade local pulmonary vasculature and parenchyma. GTD occurs in the setting of complete molar pregnancy. Because of the routine use of US and beta-hCG in the workup of early gestational abnormalities, complete molar pregnancy rarely presents with the traditional signs. Self-limited respiratory distress arises – seen in 3-10% of patients following molar evacuation, but can be up to 25% when uterus is larger than normal and beta-hCG level is markedly elevated. The acute illness usually lasts 24-48 hours, typically followed by a rapid and profound clinical improvement over the next 48-96 hours. Pulmonary trophoblastic embolism has rarely been reported to cause sudden death. The characteristic features are a febrile illness, cough, hemoptysis, and lung nodular infiltrates associated with an active focus of an extrapulmonary infection. The major complication is rupture of the cyst into the pericardium, which can lead to anaphylactic shock or tamponade. Hemoptysis is the most frequent sign but is nonspecific. Classification is based according to the clinical presentation: (a) acute fatal cases; (b) subacute pulmonary hypertension with death in less than a year; and (c) chronic pulmonary hypertension. The majority of cases follow a course of prolonged pulmonary hypertension punctuated by acute embolic episodes. GE occurs when there is a pressure gradient allowing gas to enter bloodstream: when venous pressure is negative, e.g., during spontaneous inspiration, or when the vein is located higher than the heart, gas is forced in under pressure. GE can also occur in the setting of diving with a breath hold during ascent. Venous gas embolism presents as cough, dyspnea, tachypnea, and a hypoxemic “gasp” reflex when a substantial number of the pulmonary vessels are occluded. Arrhythmias, pulmonary hypertension, right ventricular strain, and arterial embolism can develop related to shunting. A mill-wheel cardiac murmur (a splashing auscultatory sound caused by the presence of gas in the cardiac chambers and great vessels) can be auscultated. Beware: there are other diseases that can mimic NTPE. NTPE presents a diagnostic challenge, as the condition often presents with unusual nonspecific clinical signs that are frequently overlooked. They range from acute dramatic presentations such as ARDS, to signs observed late in the course of the disease. It resembles other causes of acute right heart failure, such as pulmonary embolism and right-sided myocardial infarction. Thrombotic pulmonary embolism should always be considered. Because of similarities, the presence of both thrombotic and non-thrombotic pulmonary embolism should be suspected in patients who complain of unexplained dyspnea and develop acute or chronic cor pulmonale. Amniotic fluid embolism is the only subtype that mimics left heart failure. How and/or why did the patient develop NTPE? Fat embolism (FE) most often occurs after a pelvic or long-bone fracture, endomedullary nailing of long-bone fractures, or placement of a knee or hip prosthesis. Between 0.25-11% of patients who sustain a long-bone fracture meet criteria for FE, and the incidence is higher after several fractures. FES occurs after lower extremities bone fractures, less frequently with upper extremity fractures, and rarely with vertebral or rib fractures. FE is also the leading cause of respiratory dysfunction in victims of blasts and blunt trauma. The finding of fat cells in the pulmonary vessels at autopsy in cases of natural death is caused by resuscitative measures (Figure 2). The finding of fat cells in the pulmonary vessels at autopsy in cases of natural death is caused by resuscitative measures. Other causes of FE include hemoglobinopathies, especially sickle cell disease (SCD). Bone marrow necrosis after vessel occlusion and activation of the clotting system, which may cause FE in SCD and even severe respiratory failure, accounts for 33% of sudden deaths in SCD patients with lung problems. Both pulmonary thromboemboli and FE have been found in lethal cases of liposuction. Accidental or intentional lipid overdose has been described after IV injection of preparations intended for IM use only that are frequently formulated with vegetable oils. The adverse effects associated with acute IV lipid emulsions include FE. Incidence of AFE ranges between 1/6,000 to 1/120,000 pregnancies. AFE occurs during labor but before delivery in the majority of cases and during C-section in 19% of cases. It accounts for 12% of all maternal deaths related to legally induced abortion, with a death-to-case rate of 2 per 1 million abortions. In 24 well-documented cases of AFE occurring following (surgical) trauma, at least 13 of these patients died directly related to AFE. Macroscopic tumor embolism has been reported in many tumor types, including sarcomas, hepatocellular, breast, and renal cell carcinomas. Microscopic tumor embolism was found mostly in gastric, hepatocellular, and pancreatic carcinomas and choriocarcinomas. It has also been described in lung, prostate, thymic, gallbladder, bladder, colorectal, skin, or cervical cancer. Trophoblastic embolism may be subclinical in normal pregnancy and more pronounced in eclampsia. It may also occur within hours following abdominal hysterectomy for invasive moles (abnormal proliferation of trophoblastic epithelium of the placenta), after molar evacuation, and as a side effect of chemotherapy for choriocarcinoma. Septic emboli reach the lung from many extrapulmonary sources, including infected heart valves, endovascular foreign bodies, hardware, and thrombophlebitis. The increasing use of catheters and prosthetic vascular devices and increasing numbers of immunocompromised patients have changed the epidemiology. It is now an uncommon complication of IV drug use, presumably because of improved hygiene. In a series of post-mortem examinations, fungal emboli were found more frequently than bacterial emboli in patients with hematological malignancies. Indwelling catheters and total parenteral nutrition are risk factors for fungal septic emboli. Lemierre’s syndrome is a septic thrombophlebitis of the internal jugular vein caused most often by the anaerobic gram-negative Fusobacterium species. Lung abscesses and empyema have been reported frequently in these patients. The parasite can reach any part of the body, although the liver (75%) and lungs (15%) are the organs most commonly affected. Hydatid PE occurs when a hydatid cyst ruptures into the right ventricle or atrium or occasionally because of hematogenous dissemination from a hepatic focus. The two subtypes of GE, venous and arterial, can be distinguished by the mechanism of entry and the site where the emboli lodge. Air emboli are mainly iatrogenic and primarily associated with endovascular procedures. Venous air emboli occur during the manipulation, and particularly removal, of central venous and hemodialysis catheters, where it has a high mortality rate. It is also reported as a rare complication of ventricular assist device pump dissection, ventilation-induced lung trauma, and laparoscopy that can lead to air, argon, or CO2 embolism. Other causes include pleural lavage, the intraoperative use of hydrogen peroxide, and insufflation of air during endoscopy, laser therapy, arthroscopy, thoracotomy, non-invasive ventilation, carotid endarterectomy, prostatectomy, or needle biopsies in the thorax. Arterial air emboli result from the overexpansion of the lung by decompression barotrauma leading to entry of gas into the pulmonary veins or paradoxical air emboli into systemic arteries. Which individuals are at greatest risk of developing NTPE? Many cases of NTPE have no known individual risk factors. The pathophysiology remains unclear. The increase in bone marrow pressure during intramedullary instrumentation (e.g. nailing) can lead bone contents into venous circulation. The use of conventional cementing techniques is associated with echocardiographic evidence of embolism in many patients. Surgical timing and technique have been shown to play a role in FES. Early surgical fixation (within 24 hours of trauma) carries a lower risk than delayed fixation. Intraoperative prophylactic measures that limit the rise of intramedullary pressure reduce the incidence of postoperative FE. Small fat droplets may even pass through lung capillaries and enter the systemic circulation through pulmonary or arteriovenous shunts (e.g., PFO), resulting in paradoxical cerebral FE. Previously suggested risk factors, such as large fetal size, use of oxytocin, advanced gestational age, amnioinfusion, complicated labor, or multiparity has not been determined conclusively. Logistic regression did identify advanced maternal age, placental pathologies, and C-section deliveries in one large population-based cohort study. There are no pathognomonic laboratory tests for NTPE. Diagnosis is facilitated by the presence of hematological and biochemical abnormalities. Hypercapnia and combined respiratory/metabolic acidosis can also be observed. An increase in the serum lipids is nonspecific, as an increase is seen relatively often in critically ill patients, particularly those who have received IV lipid emulsions (e.g., propofol, TPN). Disturbances of coagulation ranging from mild thrombocytopenia to DIC +/-cardiopulmonary instability have been described. Isolated DIC may even be the first indication of AFE. The Trombelastograph® test may help assess coagulopathy and guide therapy during or after AFE. ABG can show hypoxia, hypocapnia, or an increased alveolar-arterial oxygen gradient. Bacteremia with echocardiogram findings of right-sided vegetations is suggestive of diagnosis. Echinococcus serum antigens and antibodies are less sensitive but more specific than imaging techniques, making them useful as confirmatory tests. BAL typically reveals lymphocytosis with a predominance of CD8 lymphocytes. “Bubbles activate the coagulation system, complement and kinines,” but coagulopathies are rarely observed. Extravascular fluid shifts can lead to hemoconcentration. What imaging studies will be helpful in making or excluding the diagnosis of NTPE? Feeding vessel sign – parenchymal nodules located at the end of vessels, has been reported in several subtypes of NTPE, such as septic emboli. (Figure 3). The tree-in-bud pattern is recognized as a radiological sign of NTPE, such as tumor or foreign material (cellulose) emboli. These micronodules represent intra-arteriolar accumulation of the embolus with adjacent inflammatory mostly granulomatous reaction. The “halo sign”, characterized by a central area of soft tissue attenuation surrounded by a halo of ground glass attenuation can be seen in septic emboli. In early stages, bilateral lung infiltrates (CXR) or consolidation and ground glass opacities (CT) are seen. The extent of ground-glass opacities and presence of consolidation correlate with disease severity. A high incidence of relatively small (<1 cm), ill-defined centrilobular and subpleural nodules on CT scan has been described in the acute phase of FES. These nodules represent ischemia, alveolar edema, and microhemorrhages by the deposition of free fatty acids. These ill-defined centrilobular nodules indicate deposition of hemosiderin-laden macrophages. Diffuse lung calcifications located in the branches of the pulmonary arteries are described after FES. MRI brain can show lesions in watershed areas that appear as bright spots on a dark background, known as the “Starfield Pattern.” This is characteristic of cerebral fat embolism. Cerebral microembolism can be monitored by detecting microembolic signals with transcranial Doppler. CXR can reveal diffuse bilateral homogeneous opacities. Because AFE is characterized by the absence of frank pulmonary vessel obstruction, obstruction of branches of the PA during angiography is rarely seen. Echocardiography may reveal enlargement of right ventricle and main pulmonary trunk, consistent with acute right ventricular pressure overload and failure. Left ventricular failure can also be seen, which is unique to AFE compared to all other NTPE. A normal CXR with hypoxemia in a patient with a malignancy might suggest the presence of pulmonary tumor embolism: only 1 in 8 patients have a parenchymal abnormality on a plain CXR. Cardiomegaly and prominent pulmonary vasculature, the radiographic changes associated with elevated pulmonary pressures, are seen in less than half of the cases. Subsegmental, mismatched peripheral defects can be seen on ventilation-perfusion scan in patients with exclusively microvascular disease. Tumor emboli are usually located in small or medium-sized arteries, so angiography, the standard for thromboembolic disease, has poor sensitivity and specificity. Pulmonary angiography findings include delayed filling of segmental arteries and tortuosity of the third- to fifth-order vessels. CT findings can include multifocal dilatation of the peripheral subsegmental arteries and signs of pulmonary infarction as well as a tree-in-bud pattern. Pulmonary involvement occurs in up to 80% of women with metastatic GTD. Radiographic findings may include alveolar, nodular, and miliary patterns, pleural effusion, and signs of pulmonary arterial occlusion. A cardiac hydatid cyst can cause complete occlusion of the PA. Rarely, an interventricular cyst ruptures via the pulmonary veins, resulting in multifocal cystic lesions of the lung. Guided by echocardiographic findings, diagnosis is largely based on the arteriogram, which reveals segmental or lobar perfusion defects. A combined contrast-enhanced spiral CT, MRI and MRA of the chest can be useful in evaluating complicated cardiac hydatid cysts. On enhanced CT, an intra-arterial cyst has a typical hypodense appearance. As noted above, CT chest can show the feeding vessel sign, tree-in-bud parenchymal opacities, and halo sign. Pulmonary infarction with wedge-shaped lesions can also occur. Septic emboli may also lead to rapid progression of lesions to cavities or abscess formation. An echocardiogram should also be obtained to evaluate for cardiac valve vegetation. TEE provides greater spatial resolution than transthoracic imaging and is a superior method for imaging vegetations of cardiac valves, abscesses, and leaflet perforations. Initially, imaging reveals several small (1 mm) nodular and reticular opacities or interstitial nodules, some of which occur in a centrilobular distribution throughout the lungs after talc or cellulose granulomatosis. Later, homogeneous upper lobe opacities resembling massive fibrosis may be identified. Gallium lung scans may show diffuse bilateral uptake in talc granulomatosis. Cellulose granulomatosis has also been described as a cause of the tree-in-bud appearance on CT. In mercury embolism, CXRs show permanent or gradually resolving multiple small metallic spherules. In catheter emboli, radiographs may reveal a catheter fragment overlying an unexpected portion of the lung, mediastinum, or heart. Angiography or CT can confirm the position of the catheter fragment. No imaging technique alone has sufficient accuracy, so diagnosis should be made clinically. In venous embolism, CXR findings include normal findings, radiolucency in the vessels, edema, enlarged central pulmonary arteries, and dilatation of the superior vena cava. Air in the distal PA may appear in a bell shape, and CT may reveal air in the vessels or heart. Precordial Doppler ultrasonography, a sensitive technique to detect intracardiac air, is often used during surgical procedures. An even more sensitive method is echocardiography, which may detect a patent foramen ovale and/or small air bubbles as white reflections. Abnormalities on brain MRI may range from no abnormalities to local edema. What non-invasive pulmonary diagnostic studies will be helpful in making or excluding the diagnosis of NTPE? Pulmonary function tests generally show hypoxemia and a reduction of diffusion capacity. A decrease in the end-tidal carbon dioxide (ETCO2) levels, as determined by capnography, suggests a change in the relationship between ventilation and perfusion. Arterial saturation, as measured by pulse oximetry, cannot detect air emboli as readily as ETCO2 can. What diagnostic procedures will be helpful in making or excluding the diagnosis of NTPE? Fundoscopy carries minimal risk but requires experience. It may reveal fat droplets and hemorrhages in fat embolism, talc deposits in foreign material embolism, and gas bubbles in gas embolism. Amniotic fluid embolism is characterized by severe left ventricular failure. PA catheter insertion can be helpful in cases and frequently show low cardiac output and an elevated pulmonary capillary wedge pressure. In 18 documented cases of left ventricular failure after AFE, ventricular failure contributed to the fatal course in 5 cases. What pathology/cytology/genetic studies will be helpful in making or excluding the diagnosis of NTPE? For many types of NTPE, pulmonary microvascular cytology via Swan-Ganz catheter (though invasive and risky) has a high diagnostic yield. It may reveal fat emboli with fat embolism in patients who are not receiving high amounts of IV lipids, fetal cells with amniotic fluid embolism, and tumor cells with tumor embolism. Open lung biopsy is also invasive and risky but can be appropriate in select patients. It can reveal a granulomatous reaction by polarized microscopy for some foreign material emboli and specific cell types in embolic particles in a range of NTPE conditions. Fat globules can also be found in blood, urine, sputum, BAL, or even CSF. To identify free fatty acids and fat, cells may be stained with Oil Red O, Nile Blue, or Sudan Black (Figure 4). Induced sputum can also detect FE in SCD (Figure 4). However, BAL Oil Red O-positive macrophages are frequently observed in trauma patients irrespective of presence of FES, in aspiration pneumonia, and when a patient has received lipid infusions. To define FES, some authors have reported a cut-off of >5% of alveolar macrophages containing fat droplets, ranging from 10-100% (median value 46%), in cases with proven or probable FE. Blood drawn from the femoral vein and examined cytopathologically may yield necrotic bone elements mixed with fat. Pulmonary microvascular cytology consisting of blood sampled while a Swan-Ganz catheter is wedged has proven to be useful in diagnosing AFE (Figure 5). Fetal cells have also been detected in BAL-fluid (Figure 6). TKH-2 immunostaining is a more sensitive method than Alcian blue staining for detection of AF-derived mucin in lung sections. Fat emboli (Oil Red O Staining), showing as red dots in induced sputum in a massive fat embolism syndrome after bilateral hip surgery. Tumor macroembolism is clinically indistinguishable from thromboembolism, so the diagnosis is achieved mostly through autopsy. Obtaining blood from the pulmonary capillary bed to examine for tumor cells can be achieved by aspiration from the distal port of a PA catheter in the wedged position, thus avoiding contamination by malignant cells “upstream” (e.g., the liver). Blood is either filtered or spun down, and the remaining cells stained using the Papanicolaou method. The interpretation of this sample is challenging, as megakaryocytes and endothelial cells may mimic malignant cells. Some authors have demonstrated syncytiotrophoblast and multinucleated trophoblast giant cells in pulmonary arterial blood sampled during molar evacuation. Carefully aspirated blood from the pulmonary artery or specific staining of cells recovered from BAL fluid may be helpful. BAL typically reveals lymphocytosis with a predominance of CD8 lymphocytes, and talc crystals can occasionally be detected. Micro-embolic foreign material generally elicits a granulomatous reaction. Frequently, lung biopsy reveals severe granulomatous reaction or autopsy confirms the diagnosis (Figure 7). Transbronchial or open-lung biopsies can show macrophages with intracellular talc crystals. Crystals of unknown composition in a patient who injected an unknown chemical substance intravenously. Abundantly present crystals obstruct the pulmonary arteries (open lung biopsy). Identification of particulates may require electron microscopy. Polarization microscopy is an ideal means of detecting foreign material like intravascular deposits and aspirated foreign material. Talc is distinguished by its appearance under polarized light because it exhibits a birefringent appearance with sharp, elongated fibers. Cellulose particles are longer, mod-shaped, birefringent material. Crospovidone appears as basophilic particles within arteries and extravascular granulomas. Organic starch stains positively with PAS. If you decide the patient has NTPE, how should the patient be managed? Current treatments for NTPE are generally supportive. Management of ARDS as well as hemodynamic stability comprises the bulk of the supportive care. Transfusions and bronchodilators may improve oxygenation. The successful use of veno-venous extra-corporeal membrane oxygenation (ECMO) has been reported. Most patients, even those with severe respiratory failure, recover with treatment. Several agents have been used in an attempt to reduce levels of circulating fat but nothing is currently recommended. Corticosteroids, either before or after development of symptoms, have not been proven to be beneficial. If a persistent PFO is present, its closure before surgical manipulation of the fracture is feasible. Fat embolism syndrome (FES) is associated with extremely high mortality rates in those with SCD. Rapid initiation of exchange transfusion with an aim to reduce HbS to very low levels as soon as FES is suspected can be life-saving. The maternal and fetal outcome is unpredictable, but most patients require ICU admission. Management is directed towards maintenance of oxygenation and circulatory support. Mechanical ventilation and inotropic support may be necessary. Provide immediate high-quality CPR with standard basic and advanced cardiac life support protocols in patients who develop cardiac arrest. A multidisciplinary team including anesthesia, respiratory therapy, critical care, and maternal-fetal medicine should be involved in the ongoing care of women with AFE. Following cardiac arrest, perform immediate delivery if the fetus is ≥23 weeks gestation. In 65% of AFE cases, delivery had not yet occurred. Immediate delivery of fetus by C-section is mandatory to prevent fetal hypoxic damage and facilitate resuscitation. Case reports have highlighted importance of displacing uterus laterally to avoid compressing large vessels and performing an emergency C- section during resuscitation. Provide adequate oxygenation and ventilation and, when indicated by hemodynamic status, use vasopressors and inotropic agents in initial management. Inotropic support is indicated if left heart failure is observed. In some cases, afterload reduction may be beneficial in restoring cardiac output, providing preload is adequately preserved. Mechanical support, such as ECMO and intra-aortic balloon pumps, may be considered in left ventricular failure unresponsive to medical therapy. Avoid excessive fluid administration. Diuretics are useful to mobilize pulmonary edema. Because coagulopathy may follow cardiovascular collapse, early assessment of clotting status with aggressive management of clinical bleeding with massive transfusion protocols is necessary. Transfusion with FFP/pRBC ratio of 1 or more is associated with a higher survival rate in women with AFE and coagulopathy. Activated recombinant factor Vlla can be considered in the management of severe hemorrhage secondary to AFE. While some case reports support its use, others show significantly worse outcomes than cohorts who did not receive rVIIa. rVIIa should therefore only be used in AFE when hemorrhage cannot be stopped with standard transfusions. Leukocyte depletion filtering of cell-salvaged blood obtained from C-section may reduce particulate contaminants. Several studies have revealed no increased risk of complications after autologous blood autotransfusion during C-section. Successful hemorrhage management may be further optimized by uterine artery embolization, thereby avoiding hysterectomy. In light of the similarities to anaphylaxis, corticosteroids and epinephrine have been suggested as useful therapeutic adjuvants. The successful treatment of a moribund patient with cardiopulmonary bypass and PA thromboembolectomy has also been reported. The prognosis is poor with a median survival of only a few weeks, so interventions to cure or slow the progressive deterioration are rarely performed. However, surgical cure by resection of primary tumor has been reported in atrial myxoma, renal cell carcinoma, and choriocarcinoma. Chemotherapy is rarely indicated, although favorable results have been reported in patients with choriocarcinoma and breast cancer. Preferred therapy consists of diuretics and ventilatory support. Emergency pulmonary embolectomy under cardiopulmonary bypass has been reported for an embolism of malignant trophoblastic material. Improved outcomes for patients with SPE are attributable to earlier diagnosis, administration of broad-spectrum antibiotics, and improvements in surgical care (Figure 8 and Figure 9). 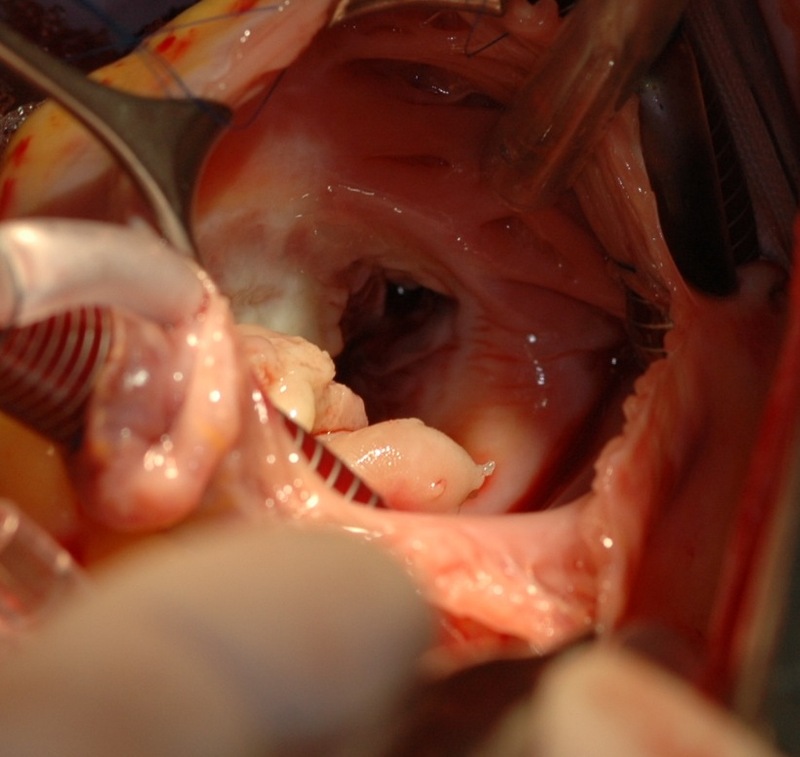 The successful outcome after pulmonary endarterectomy in isolated cases suggests that this “controversial procedure” can be considered in isolated cases of pulmonary valve endocarditis with chronic pulmonary hypertension. Gram staining of this destroyed triscupidal valve shows abundantly present bacteria. When a right-sided cardiac hydatid cyst is diagnosed, early surgical treatment should be performed via open-heart surgery. Median sternotomy and the use of extracorporeal circulation is the surgical approach of choice when cysts are present in cardiac chambers. Embolectomy by removing multiple fragments of a ruptured endocyst of the PA, followed by surgical closure of the cardiac cyst cavity, can be performed. Surgical intervention can be complicated by rupture of the artery and/or the cyst. Surgical treatment combined with chemotherapy may improve prognosis, but medical therapy is advocated for those with recurrent hydatidosis or in those high risk for surgical intervention. Given the high complication rate associated with embolic catheter fragments, effort should be made to recover these foreign bodies prior to central embolization. Many non-surgical techniques have been developed to remove catheter material from vessels. Talc granulomatosis and embolization of other foreign materials may cause pulmonary hypertension and fibrosis. Treatment with corticosteroids has been attempted with gradual or temporary improvement, although there is a risk of relapse after cessation. Recurrent and ongoing IV drug abuse, leading to a histiocytic reaction in the transplanted lung, should raise substantial concerns about performing lung transplant. Early and aggressive treatment is key. The mainstays of therapy are administration of 100% oxygen and hyperbaric oxygen therapy (HBOT). Administration of 100% oxygen allows for nitrogen washout of the lungs and a favorable gradient for exhaling excess nitrogen gas, therefore decreasing the size of the air bubbles. HBOT decreases cerebral edema, improves oxygenation, and diminishes activation of leukocytes. However, HBOT itself occasionally causes cerebral arterial gas embolism. The patient may also be placed in the lateral decubitus and Trendelenburg positions for no longer than 10 minutes to prevent right ventricular outflow obstruction, Patients with arterial embolus should be placed supine. The buoyancy of gas bubbles is not sufficient to counteract blood flow, so such bubbles are propelled toward the head even when the patient is in a head-down position. The head-down position may also aggravate cerebral edema. Evacuation of air from right ventricle with the use of a central venous or pulmonary arterial catheter is recommended. Occasionally removal of up to half of the entrained gas can be achieved, with optimal placement of the catheter tip 2 cm below the junction of the superior vena cava and the right atrium. If cerebral air embolism occurs, permissive hypertension is beneficial, because it facilitates bubble redistribution to the capillaries and veins. The goal is to maintain at least normal blood pressure and to prevent hypotension. Seizures should be suppressed with barbiturates, which also reduce cerebral oxygen consumption. Hemoconcentration secondary to fluid shifts results in increased blood viscosity, and therefore normovolemia should be achieved by the administration of colloid solutions. FE is largely self-limiting and usually associated with a good outcome. The focus should be on prevention. Early immobilization, open reduction/internal fixation of fractures, and methods to reduce intramedullary pressure during total hip arthroplasty has reduced the incidence of FE. The exact method of fracture fixation, as opposed to the moment of fixation, plays a minor role in the development of pulmonary dysfunction. AFE is a leading cause of maternal mortality in developed countries. Maternal full-term gestational weeks, multiparous, and non C-sections are risk factors for death after AFE. The reported case fatality rate continues to be high, accounting for as much as 10% of all maternal deaths in the US. The mortality ranges from 21.6% to 86%. Although there is still significant maternal and neonatal morbidity, the vast majority of women survive. However, among the survivors in a large registry, only 15% were neurologically intact. The prognosis is poor; median survival from diagnosis is only a few weeks. The prognosis varies widely: for patients with mercury emboli, the prognosis is good, although death has been reported. The clinical findings described in silicone embolism syndrome are similar to those observed in FES. A mortality rate as high as 24% has been reported. Massive venous and arterial gas embolism is characterized by a high mortality rate of 21%, 69% of which died within 48 hours. When >50 ml of gas is injected abruptly in human veins, acute cor pulmonale, asystole or both can occur. The lethal volume of injected air is estimated to range from 100-500 ml. What other considerations exist for patients with NTPE? The complex pathogenesis of different subtypes of NTPE is more complex than “simple” mechanical obstruction, as NTPE also lead to severe inflammatory reactions. Fat emboli initiate a biochemical and inflammatory cascade: FE may be metabolized to free fatty acids and glycerol by lipase, and free fatty acids induce cellular damage, capillary leaks, and clot formation. It is unclear why this cascade occurs in some patients and not others. The severity of symptoms is driven by the antigenic potential of abnormal AF. Finding squamous epithelial cells from the fetal skin in the PA alone is not pathognomonic, the combination of symptoms with detection of these cells is required. Tumor emboli have an unusual level of resistance to recannulation, so they are more likely than other types of emboli to lead to irreversible obstruction. The pathogenesis is unique because the tumor arises from fetal, not maternal, tissue. Therefore, trophoblastic embolization sufficient to cause severe pulmonary compromise is rare. Various volatile anesthetic agents diminish the ability of pulmonary circulation to filter out gas.